The Ilyushin Il-2 (Cyrillic: Илью́шин Ил-2) Sturmovik was a ground-attack aircraft (Cyrillic: Штурмови́к, Šturmovík) produced by the Soviet Union in large numbers during the Second World War. With 36,183 units of the Il-2 produced during the war, and in combination with its successor, the Ilyushin Il-10, a total of 42,330[ were built. 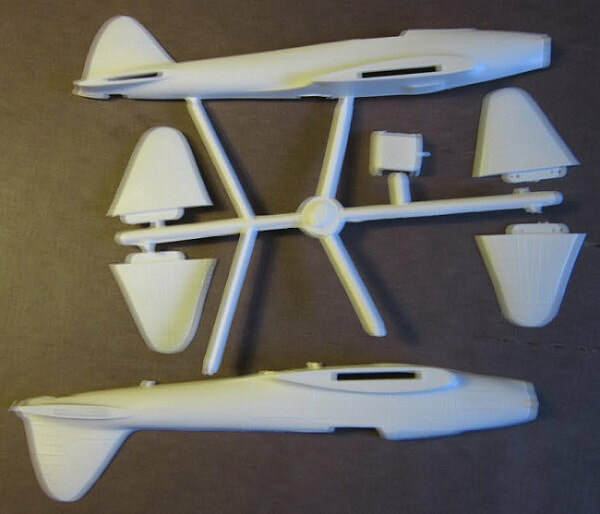 Making it the single most produced military aircraft design in aviation history, as well as one of the most produced piloted aircraft in history along with the American postwar civilian Cessna 172 and the Soviet Union's own then-contemporary Polikarpov Po-2 Kukuruznik multipurpose biplane. To Il-2 pilots, the aircraft was simply the diminutive "Ilyusha". To the soldiers on the ground, it was the "Hunchback", the "Flying Tank" or the "Flying Infantryman". Its postwar NATO reporting name was "Bark". The Il-2 aircraft played a crucial role on the Eastern Front. Joseph Stalin paid the Il-2 a great tribute in his own inimitable manner: when a particular production factory fell behind on its deliveries, Stalin sent an angrily worded cable to the factory manager, stating "They are as essential to the Red Army as air and bread." "I demand more machines. This is my final warning!" This kit was obviously made in Russia, because the test on the box and in the instructions is all in cyrillic Russian. The kit comes in end-opening type box. It is not shrink-wrapped and is held shut with tape. I am no fan of this type of box, because invariably parts or the decal sheet find their way past one of the end-flaps to become lost forever. Give me a tray and lid type box any day of the week. 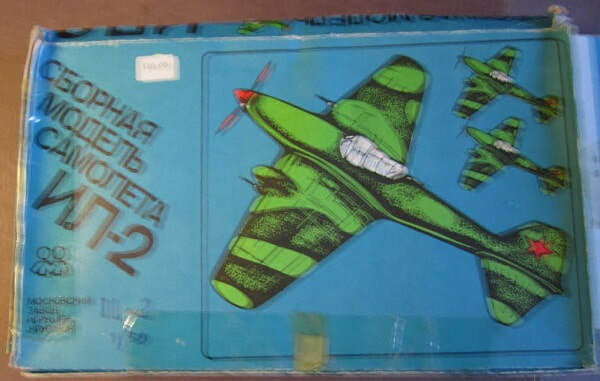 The box art shows illustrations of 3 IL-2's in black and green wave patterns on top. I assume the undercarraiges are light-blue because that is the usual practice of colors used on Soviet aircraft. The illustrations are probably the worst box arts I've ever seen and very amateurish. Planes are all posed against a blue background. 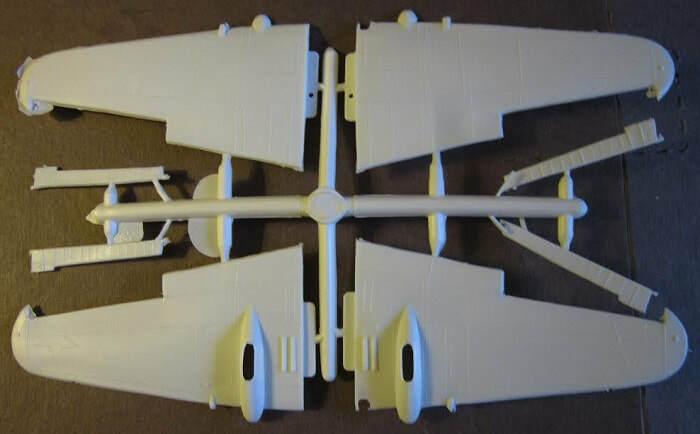 This kit holds 3 chalk-white trees, a loose chalk-white propeller, a dark-grey tree, a clear tree, the decal sheet and the instructions. 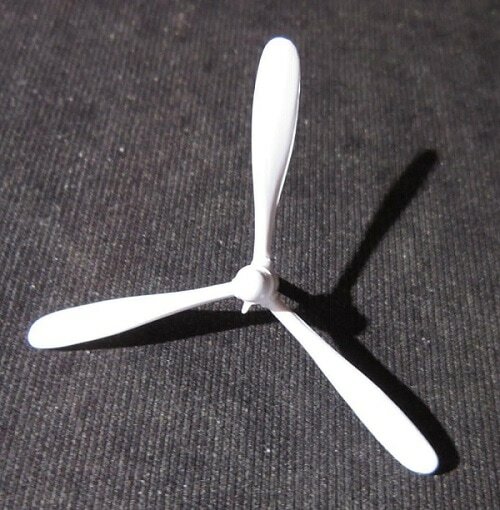 ​Next is the loose chalk-white propeller. ​The clear tree holds the canopy. 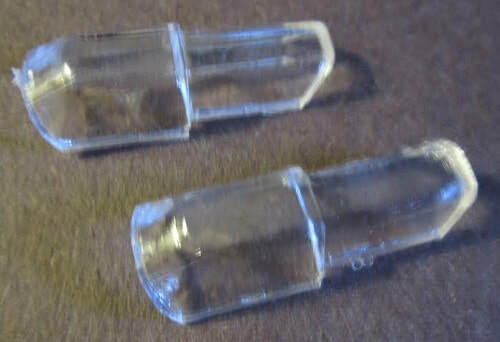 There are 2 identical closed ones. 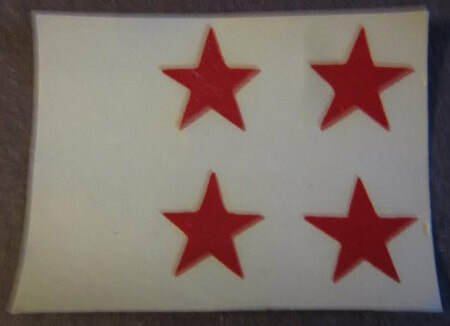 ​The decal sheet only holds 4 Soviet Air Force red stars. This is not enough stars as normally Soviet aircraft have stars in 6 positions. ​The instructions complete the kits contents. It consists of a single sheet that is 8 1/2" x 6" format, printed on both sides on tan news-print type cheap paper. 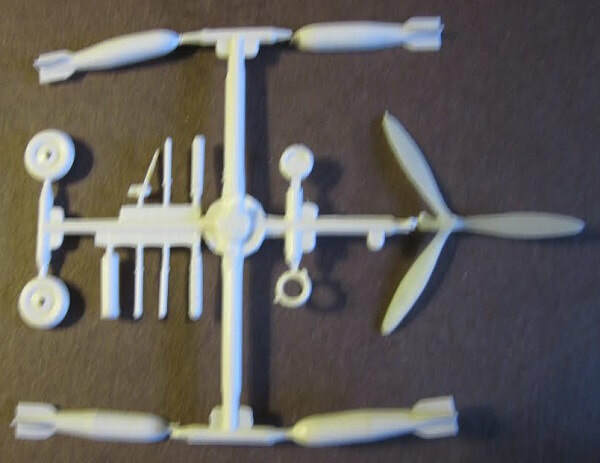 The face side has a listing of the names of the kit parts in Russian only. The reverse side has 3 assembly steps on it. This is fairly nice kit in an odd scale of 1/50th. I got this kit in trade with a fellow in Krakow, Poland years ago. I am willing to sell it for a decent offer + postage.